Like poison hemlock, this plant also belongs to family Umbelliferae, and is a weed that grows along the banks of lakes, streams, and marshes. 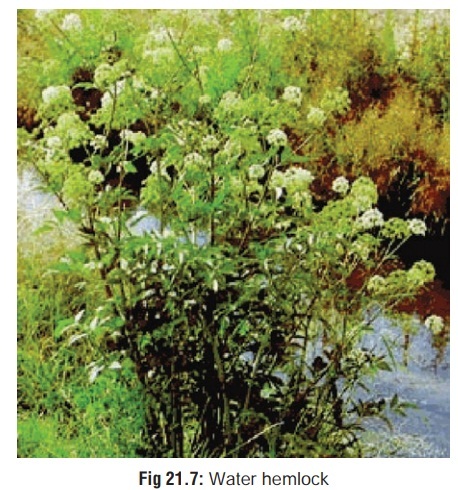 ■■ Like poison hemlock, this plant also belongs to family Umbelliferae, and is a weed that grows along the banks of lakes, streams, and marshes (Fig 21.7). ■■ It is characterised by its thick, hollow, tuberous roots, but is often mistaken for several wild edible plants such as Daucus carota (Queen Anne’s lace). All parts, particularly the root. Cicutoxin, which is among the most potent biotoxins. It causes over-stimulation of central cholinergic pathways. · Gastric decontamination: stomach wash, activated char-coal. · Diazepam or barbiturates for convulsions. Refractory cases may necessitate administration of general anaesthesia. · Haemodialysis may be helpful. · Most cases of poisoning result from mistaken identity with edible plants (vide supra)..